Muted 4Q comp outlook improves sightly from November, helped by better than expected results for Olive Garden & LongHorn (+3.5%/+2.9%, respectively vs. initial +1.9% blended outlook). While Total Foodservice sales are trending up slightly in 4Q through November, growth remains well below the summer peak. 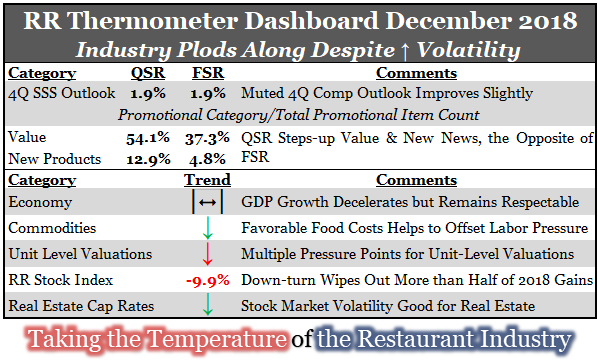 QSR value mix increased in December following a 2 month decline after its September peak. The $5 price point remains sharply in focus and represents 21% of value offers. 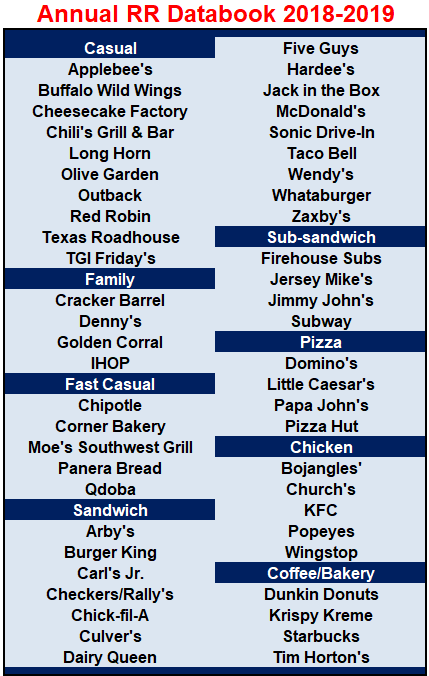 New product news increased after a weak November with recent intros including: Jack in the Box's Pannidos; McDonald's Signature Crafted Mushroom & Swiss Sandwiches; and Sonic's Fritos Chili Cheese Lineup. 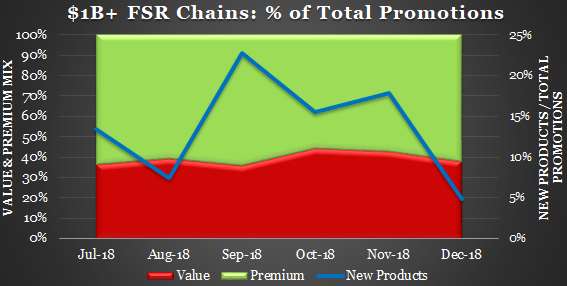 FSR value mix continues to trend down with most of the decrease attributed to fewer $14 - $15 promotions. 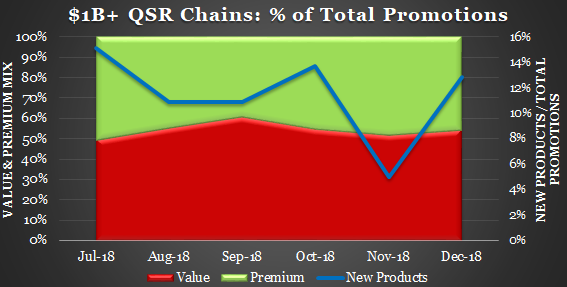 The number of new product intros also declined to an LTM low (4.8% mix). 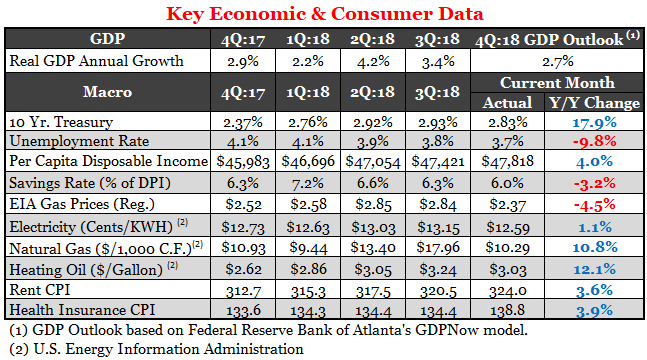 4Q GDP growth outlook was trimmed again slightly to 2.7% as economic activity continues to decelerate from 4.2% in 2Q to 3.4% in 3Q. Pros: increasing disposable income; record low unemployment rate; strong consumer confidence (although a sharp decline in December trimmed the index to its July level); and lower tax rates for 2018. Gas prices also fell sharply in December and are now down 18% from the May peak. Cons: rising interest rates (which moderated in December & declined to under 2.6% during the first few days of January) and stock market volatility. The BLS Foodstuffs Index declined for the 3rd consecutive month and ended 2018 down -1.3% y/y with cheese reaching a new LTM low. 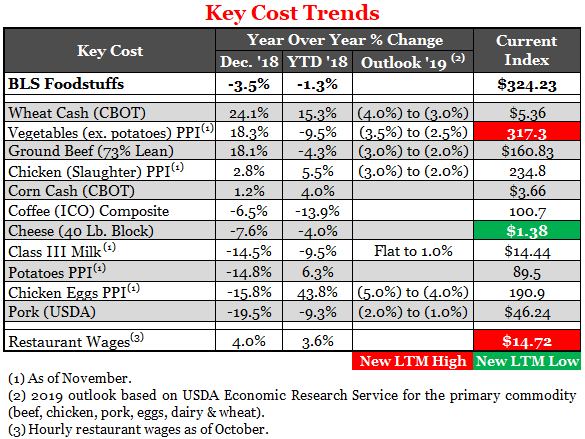 2019 USDA outlook is favorable with the chicken price outlook revised lower for the 2nd consecutive month. 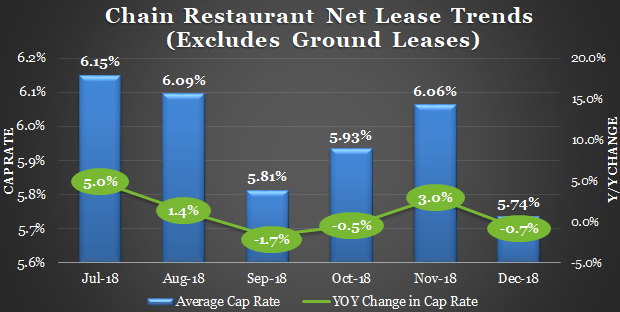 RR survey results indicate 2H:18 franchisee EBITDA valuation multiples declined slightly from 1H:18 and are expected to remain under pressure in 1H:19 due to unit level margin challenges driven by modest sales prospects & rising labor costs. Also, valuations are pressured by higher interest rates and greater supply. Finally, we hear that some lenders are turning more cautious although overall access to capital remains strong. RR's $1B+ Stock Index followed the broader market's sharp down-turn in December, wiping out more than half of its 2018 gains. 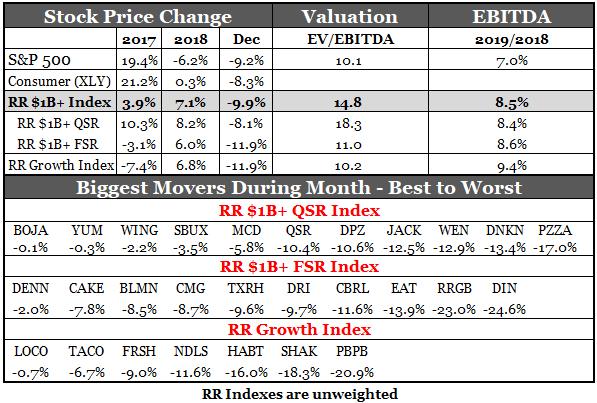 However, the RR index still managed to strongly outperform the broader market during 2018, up +7.1% vs. a -6.2% decline for the S&P 500. Cap rates fell sharply in December to just above the 7-year low set in January 2018 (5.71%) as stock market volatility and lower supply (29% fewer transactions y/y) increased investor appetite in this space.